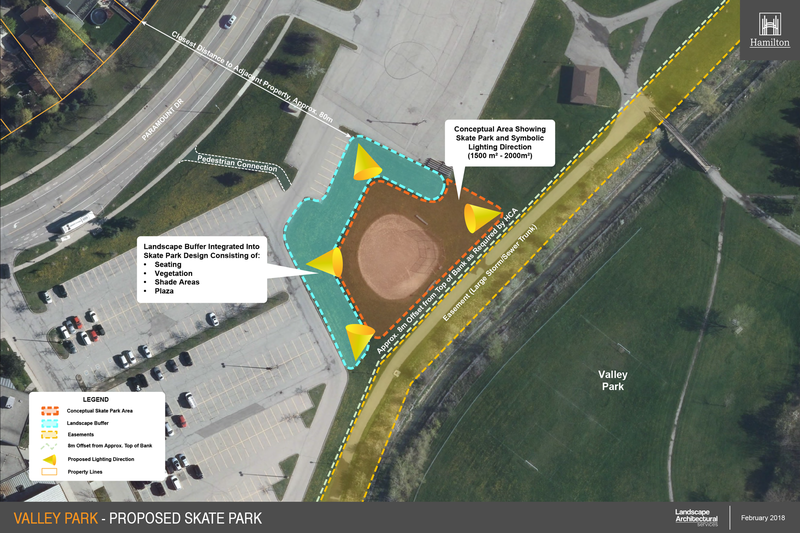 Valley Skate Park is proposed to be a wheeled sport facility located within Valley Park in Stoney Creek (Ward 9). The project proposes the development of a +/-1,500m2 (16,145 Sq.Ft) concrete facility that will cater to a variety of wheeled sports such as skateboarding, rollerblading, scooters and BMX bikes. Valley Park is home to an arena, gym, pool and Valley Park Library. Exterior amenities within the park include baseball diamonds, tennis courts, soccer field and recreational trails. The site offers ample parking, open space and home to a section of Felkers Creek that meanders through the property. In 2017, Recreation completed an in depth skateboard park study that aided in identifying Valley Park as the ideal site for this facility. Staff are looking for feedback from the Stoney Creek community on the proposed project and thoughts on incorporating it within Valley Park itself. You may provide your feedback directly through the Ward 9 Councilor office or by completing the online survey which closes April 12. If you are not already part of our Valley Skate Park circulation list and would like to be, please forward your contact information to ValleySkatePark@Hamilton.ca and we will be sure to keep you up to date on the projects ongoing progress, workshops, meetings etc.